Their most successful US album was A Space In Time, notable for the use of electronics for the first time. It went gold in the US, but only managed No 36 in the UK, where their popularity was waning. This wasn't surprising since the band spent much of their time abroad, particularly in the US, where they also enjoyed a number of minor 45 hits like I'd Love To Change The World and Baby Won't You Let Me Rock'n'Roll You. After recording Rock And Roll Music To The World in 1972, which met with modest Chart success, they took time out to pursue solo projects, although a double live album, Recorded Live, was released in the Summer of 1973. It utilised material from concerts at Amsterdam, Frankfurt, Paris and Rotterdam. In February 1973 Alvin Lee recorded a solo album, On The Road To Freedom, with Mylon Le Fevre, a US gospel singer. A number of famous rock personalities also guested on the album - Stevie Winwood, Jim Capaldi, George Harrison and Ron Wood. It peaked at No 138 in the US Charts. Chick Churchill also put out a solo album but this didn't sell in any great numbers. In 1974, Alvin Lee Co. recorded "In Flight" live at the Rainbow Theatre in London, and the following month Ten Years After played a sell-out UK concert at the same venue. It was to be their final UK gig, although the band continued to tour the 'States through the summer of 1975 where their final album, Positive Vibrations, peaked at No 81 in the US Album Charts. After their demise, Lee continued to record some reasonably successful albums with his own band, Alvin Lee Co. In March 1976 he formed Ten Years Later and upon their demise in 1980 he put together the first of a series of Alvin Lee Bands which he worked with throughout the eighties. 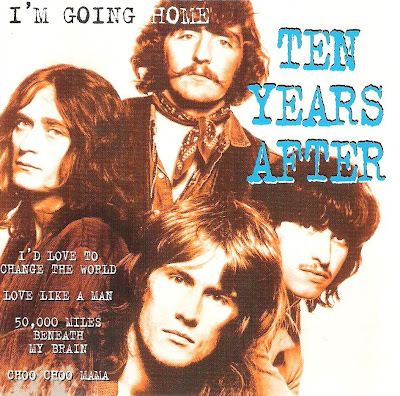 Ten Years After are always going to be remembered for Lee's flash, fast-fingered guitar playing as epitomised by their appearance in the 'Woodstock' movie. Ironically, this not only made them superstars, it also proved a straight-jacket for audiences' musical expectations of them which they were never able to shed in subsequent years.